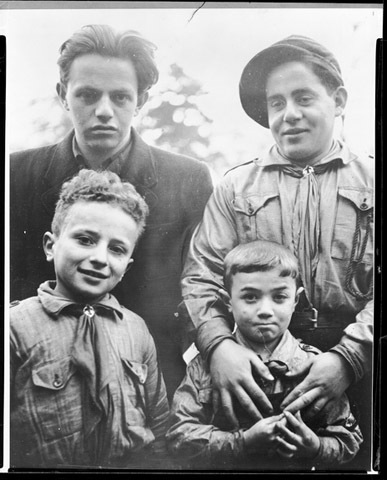 JDC - Archives : A group of four young Jewish boys, survivors from Poland recently brought to France on transit visas. Title A group of four young Jewish boys, survivors from Poland recently brought to France on transit visas. Description A group of four young Jewish boys, survivors from Poland recently brought to France on transit visas. They will be cared for in France by JDC and other French welfare organizations, such as the Comission Centrale pour l"Accueil des Enfants aupres l'Agence Juive, while they wait for immigration opportunities to Palestine.